Learn the ins and outs of consumer demand to lead the way in marketing the world’s future innovations. Being a marketer means having an analytical and strategic approach to business decision making underpinned by consumer insights. Marketing is crucial for the survival and growth of any organisation. For businesses, social enterprises, celebrities and cities alike, effective marketing helps deliver value to target audiences through the design of great products and services, and the creation of positive experiences. When you study the Bachelor of Business (Marketing) you will put marketing principles and concepts into practice, develop critical thinking skills and make informed strategic choices in marketing consultancy projects. While acquiring a firm grounding in business decision making, you will learn to think critically about a variety of marketing scenarios. Internships also offer the opportunity to reflect on marketing practice and engage with local enterprises, adding practical experience to your CV and enhancing your employability prospects. Our marketing major is taught by world-class lecturers with scholarly and real world experience. You will be joining the longest standing marketing school in the country and be taught by internationally-ranked professors. Because Massey University’s teachers are actively researching, you will be taught the most relevant perspectives, from the most influential academics, in the most experienced environment. By giving you sound knowledge of marketing principles, how to apply them and how to evaluate them, Massey’s Bachelor of Business (Marketing) will teach you how to take great ideas and turn them into great profits for your employers. Your marketing major will cover all the essential components of marketing including consumer behaviour, marketing management, strategy, branding, research and analysis. We’ll teach you to think independently and analytically, helping you understand how to use the information you have at hand, to solve issues that you face. Choose courses that deepen your understanding of forward-thinking strategies and cutting-edge business practices ­– everything you need to think and act as a professional marketer. As well as academic knowledge, employability and professional skills development are embedded throughout our degree. You will be able to take the issues organisations (or your own business) face, creatively consider how to address them and implement your solutions with style. When you have completed your studies you’ll be a real asset to your employers because you’ll ‘hit the ground running’. You’ll know how to think and act on challenges facing the 21st century business world. The Bachelor of Business will give you many skills you can use in many different types of businesses, in New Zealand and around the world. You will be someone that has a sound base in the business fundamentals of accounting, economics, finance, management, marketing, law and communication. 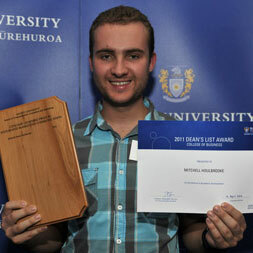 Massey University’s business and management studies ranks in the top 250 (by QS (Quacquarelli Symonds) rankings). We are also ranked in the top 150 universities worldwide for business administration programmes by the ShanghaiRanking's Global Ranking of Academic Subjects. Our lecturers are actively researching, bringing the most relevant developments in business theory and practice to your study. I really wanted to do a business degree, but the choices were numerous - I had heard so much about each university's business programme, but I was very confused as to how I should decide which one to pick. I wanted a place where I would feel comfortable and at home, but also one that gave me a top-class education. I strongly considered other universities, and I'm sure that many of them are also great institutions, but what turned me off was how far away they were, and their environments. Massey Auckland was so close to where I had always lived (Warkworth) that it seemed crazy to not have it as my first choice. The open days Massey held showed me what a pleasant environment it was - none of the stress, crowds, and fast pace of the inner city universities, but still right next door to Albany, and not far away from the central city at all! I had also heard that the lecturers at Massey were fantastic from some other students at the university I had met. What sold me on Massey was when I found out about their conjoint Business/Arts programme. It gave me the perfect opportunity to pursue what I loved in business (Marketing), and all the other fascinating subjects I was beginning to show interest in, covered by Massey's arts programme. Although it was a four year degree, up from the three years of a regular bachelor's, it made a lot of sense for me. I was hugely excited to be studying all my favourite subjects in an environment that really made me feel at home. I loved the relaxed atmosphere here at Massey, and feeling of community provided by all the staff and students. The School of Communication and Journalism ran many of my favourite courses, and their lecturers stunned me with their enthusiasm. You cannot leave a lecture here without feeling really excited about the subject you're learning about. Of course, each lecturer believes their particular subject area is the solution to all the world’s problems, but their passion is infectious, and soon I found myself thinking on exactly the same page as them. All the lecturers in the CJM school showed incredible expertise. My internship has been helped immeasurably by the education I've had here. I'm right up with the play on all the concepts my boss uses, and I'm able to give him professional feedback on his marketing plans. I'm really excited to head into the working world, and I know my degree is going to be the key to my success. Whatever you do with your future, marketing is certain to enhance your career prospects. What’s more, if you want to set up your own business one day, it will be your marketing training that will make it happen - it’s a key element in all business activity. This marketing major prepares you for not just marketing jobs, but also for senior positions in most areas of business, academia, and the public sector. You could also take your skills and use them to start up your own business. Massey marketing graduates have a great reputation and are keenly sought after by employers. Almost every sector needs people who have marketing skills. You could find work in business or non-profit organisations in a huge range of industries.